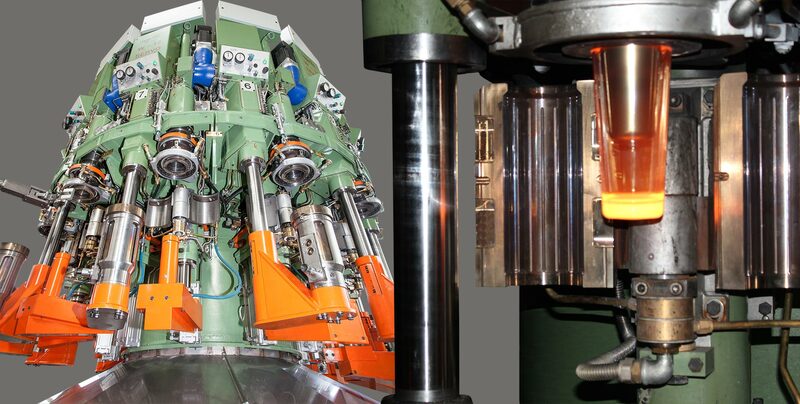 Our press-blow machine is the consequent further development of the conventional process, where high-quality hollow glasses are produced by pre-forming, pre-pressing and blowing, both in rotation blown-ware operation and in non-rotation blown-ware operation. Contrary to the well-known machine concept, where the process movements, such as pre-pressing and others, are realised pneumatically, WALTEC replaced the pneumatic drives, which could only be adjusted in a dissatisfying way, by the latest servo technology in all ranges. That means, all movements of pressing plungers, pre-mould and article support are realised with servo technology. For the first time the press-blow process becomes transparent, can be controlled exactly and is reproducible. Thus, all movements have a very high repeat accuracy, resulting in high process stability. Furthermore, WALTEC met the requirements of the market for bigger products. Our machine is fit to produce articles with the following maximum dimensions. In connection with our burn-off as well as laser crack-off machines we enable our customers to produce stem ware in high quality, increasing the range of application and consequently the efficiency of the machine essentially.